I often like to say, that every job has its tool. If you use the right tool for the job you make your life easier and the results speak for themselves. If you have a Karcher pressure washer, you’ve already made a good decision to take control of your home cleaning needs, avoiding the need to hire a professional. Take it a step further and outfit your power washer the best pressure washer accessories for every type of job you have before you. In this article I’ll review the best Karcher attachments by category so you know you’re getting the right tool for the job. Since the accessories are made specifically for Karcher products, you can use most of them for any model pressure washer. Soft, yet sturdy, bristles coupled with the high-pressure water make for a must-have car washing accessory if you have any model Karcher pressure washer. Attached to a detergent system, you are able to give your car the same treatment as a professional car detailer. The wide brush gives a clean sweep of a larger area making quick work of the job. Getting the clean up done in less time means you’re more likely to use it often, resulting in a sparkling car that feels good to drive. The edges of the brush head are topped with ribbed rubber to avoid any damage to the car if you accidentally bang it. That’s a detail that helps to feel confident that Karcher cares about your cleaning experience. It can be attached directly to the trigger gun or for more reach, an extension rod. Gentle on wheels, you should have this tool in your kit to get that stubborn brake dust off of your expensive (or not!) wheel rims. The bristles are hard enough to remove the grime, but gentle enough to not damage the rims. The only negative really is that it is a bit large to get into some of the tighter recesses of certain rims. If you have rims with many spokes, make sure you measure the openings to determine if this brush will fit. For reference the tip of the brush is 6 inches diameter tapering to 9 inches in diameter at the base. Suitable for varnish on cars & motorbikes; Ideal for vehicles, garden furniture, facades, stairways, caravans, paths, walls, terraces, driveways glass, stone etc. Whether it is a spring cleaning job to get rid of a long winter’s residue on your car, or you live in a rural area that keeps your car in perpetual mud mode, you definitely need to give your car a soak in a foam broth. Use this foam jet nozzle to coat your car with the detergent of your choice. Many Karcher models have an integrated detergent system, which is convenient until you want to use a different detergent than the Karcher brand. This foam jet then gives you more options to clean your car. A 0.6-litre capacity is more than enough for even the hardest to clean residue on your car. It can be used for soaps, varnishes or other cleaning products. 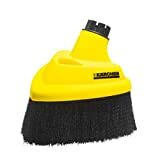 I was unsure where to categorize this attachment as it can be used brilliantly for cleaning the undercarriage of your car, the roof or even in narrow spokes of your wheel rims. It is a great Karcher accessory, then. But, it is also the best pressure washer attachment for cleaning out your house gutters. The head is angled at 90 degrees and sports a powerful fan of water. The lance is long enough to reach some tough to reach areas making it very versatile. Let’s just file this attachment under “Multi-Use” and not pigeonhole it in one category so you can make sure you get plenty of use out of it for various applications. With just one use, you could essentially have this attachment paid for. Leave extortionary rates to wash your gutters or clear your drains behind and take matters into your own hands. This is the best power washer accessory to clear gutters as it has an ingenious gutter sledge that rides along the gutter, clearing a path with high water pressure. Rather than stand unsteadily on a ladder, let the sledge do the work for you while you stand safely on terra firma. One thing to note is that for tough build up in a gutter, you should have high-pressure models like the K5 to K7. If you are looking to use it as a preventive measure regularly to prevent that type of build up, then you could get away with a lower pressure model. Continuing my love affair with multi-use tools, this serves equally well as a way to clear slow or blocked drains. Again, the cost of having a plumber come to your house is more than what you will spend on this attachment, saving you money even if it is only used once. 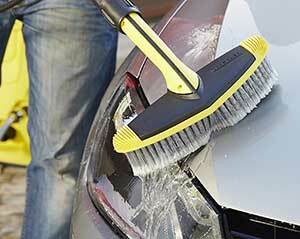 Another in the growing list of multi-use tools by Karcher is the rotary wash brush. Use this tool to gently, yet thoroughly, clean your car, boat, caravan, house siding, deck furniture, or the decking itself. It is good to use on wooden surfaces as well as painted, without doing any damage. The brush rotates taking on the brunt of the scrubbing action so you don’t have to. Make quick work of your cleaning job. The head can be angled to 90 degrees to make it even easier to use on uneven surfaces. Protective grille for gravel surfaces and adjustable cleaning pressure when cleaning different surfaces such as stone and wood. Handle to clean verticle surfaces. It doesn’t matter what kind of surface you have on your patio or driveway. The T450 Patio Cleaner is the best attachment to clean just about any surface quickly, effectively and safely. With an adjustable knob, you can control the pressure for the type of surface you are cleaning. Making it ideal for cleaning wood decking or concrete equally well. Not only that, but gravel is also washable thanks to a protective grill. The shape is angled as a triangle for getting into corners and an extra power nozzle cleans right to the edges. It works similar to a vacuum cleaner. With buttons on top to release the handle with the press of a foot. NB-The T450 is only compatible with the K4 through K7 Karcher Models. If you have a K2 or K3 then consider the T350 Patio Cleaner instead. For especially stubborn dirt, you may need some scrubbing power besides the water jet to get a deep clean. The PS40 is the best brush to use on your deck, patio or boat especially if you have stairs. It can give you a powerful clean right up to the edge of any surface. A nice bonus is the built-in squeegee to move the excess water where you want it. It is designed to avoid spraying beyond the bristles, keeping your legs dry as you clean. The three built-in water jets combined with the sturdy bristles make it an ideal tool for just about any outside job. One thing to note, however, is that the bristles are rigid and may damage paint so best to not use it to wash a car or house siding. If you have used the Karcher Dirt Blaster lance, then you know the power it has to power through some tough debris. You probably also found that it blasts debris all over the place as a result. This splash guard could be the solution you are looking for to keep your clean up time to a minimum. Attach this brush to the Dirt Blaster lance and keep the brush on the surface you are cleaning. 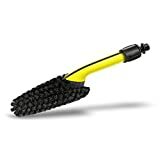 No need to press it down as the bristles work best when they are fully extended and when pressed leave openings for the water and dirt to escape. Though the bristles aren’t there for scrubbing, they do give you a bit of an abrasive to get you that extra bit of cleaning power if needed. The triangle shape makes it ideal for getting into tight corners and stairs. Which Karcher Attachment is Best? Though this list is far from exhaustive, I think it’s a good primer to get you started with finding the best accessories for Karcher pressure washers. You may want to add a special lance like an adjustable jet lance, or a Dirt Blaster lance, for when you need some heavy duty cleaning power. Or, you may want a longer hose to give you more of a cleaning radius. Whatever your cleaning need, chances are that Karcher has a tool specific for the job.